3 weeks post - op - staple removal + Photo! Finally got to see what the heck happened. My surgeon says all went really well, he was happy with how everything looked and said 4 more weeks of NWB and I get a splint tomorrow. I’ll add a photo (if I can figure it out), as you can see, staples were holding the parts together - the removal wasn’t the most enjoyable event but - hey - it is over. He said I can do range of motion to keep things moving but not to stretch the tendon significantly. I had my injury 12 days ago, so far - here is my experience. I took pain killers for the first 3 days after surgery and - like many - tried to get away from them as soon as possible. The first few days - it was really important to elevate my foot very high, as it is suggested. I could actually see the purple go out of the toes when you lift it up. The temporary cast started unraveling on about day 10, I have repaired it a little but it needs more work. One question that has been on my mind - and I know it is just playing with my mind is - When I go to the doctor - is he going to tell me that one of my twitches re-ruptured the tendon? The last couple of days I have what I would consider “incision” pain - it feels like the cast is pushing against the suchers or something - if I get the right position is seems ok. I can’t get in to see my surgeon until the 3-week mark (August 20) I am a little bummed by this but I realize I just need to take time and let it heal - maybe this will teach me some patience. My wife is having a hard time with all this too, pretty overwhelming - -I feel sorry for all the extra work I have caused her - I’ll just have to get her something nice for Christmas. I can’t wait to get back to a position where I can help her out again. Well, I’m here - Achillesblog.com. 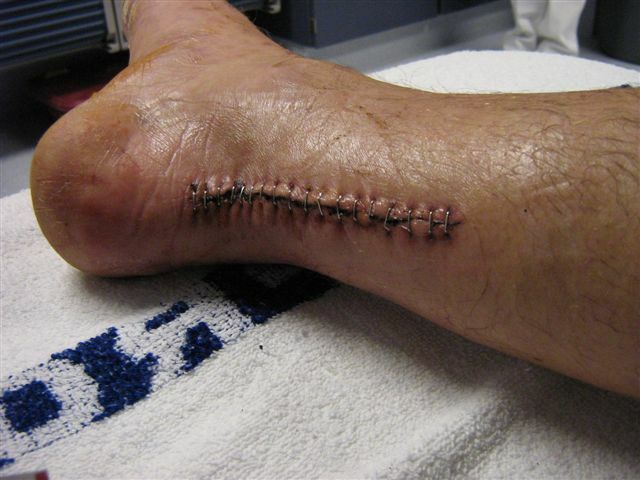 I suffered a complete rupture of my right Achilles on Tuesday night @ 9PM (July 29th, 2008) while water skiing. I am a slalom skiier and was rounding 3 ball when the ski virtually stopped in its tracks and I went forward. My front foot (left) came out of the binding and my back foot did not. I could tell right away it wasn’t good. Once I removed my foot, you could see a dent in my ankle where the tendon should have been. Straight to the hospital and had sugery the next morning to repair. So, now it is Friday - and I am beginning to learn how to recover.